AOL is a web portal and online service provider. Since its early pioneering days in the 1990’s, AOL has been one of the most recognized web brands in the United States. Originally it provided dial-up service, web portal, e-mail and instant messaging. Nowadays, AOL invests in media brands and advertising technologies, having mobile ad-tech capabilities. If you want to create an AOL email account, things are straightforward and simple. You will get unlimited storage, 25 MB of photo and video attachments, advanced spam filters and virus protection. You’ll also be able to connect to your inbox everywhere, on your laptop or your mobile devices. The first step in order to create an AOL account is to open a new browser window and go to the AOL mail sign-up homepage, here: https://i.aol.com/reg/signup . Write your name in the corresponding “First Name” and “Last Name” (surname) fields. Pick a username for your email address. AOL will suggest several combinations of the first name and last name your provided at step 1, but you can write another, if that’s what you wish. 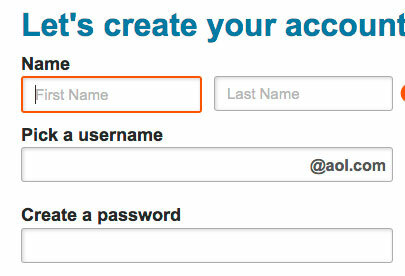 The only rule is to pick a username that is unique, as this will be part of the email address of your AOL account. The domain of your email address will be @aol.com. Create a password and write it in the corresponding field. The main rule you need to respect is regarding the length of the password: AOL email passwords need to be between 8-16 characters long. AOL passwords are case sensitive and you can include special characters. On the right side of the “password” field will you can see a “Password strength” meter. Confirm the password chosen. If the passwords do not match, you will be prompted to write it again. Enter your date of birth in the corresponding fields. To enter the month, you will go to a drop-down menu and select it. After that you need to write the day (dd) and year (yyyy). To create an AOL account, you need to be at least 13 years old. Select a gender. This field is mandatory. Apparently, AOL needs this information to tailor the news stories that appear on your AOL homepage. Enter your ZIP code. Please enter a valid zip or postal code in the corresponding field. This will be used for the weather app and local stories in your newsfeed. Next, you need to set a security question. From the drop-down menu, select a security question. This step is mandatory, and you will use this security question to recover your account, in case you ever forget your password. What was your childhood nickname?What was the name of your first pet? In which city did your parents meet? In the box below, write the answer to the security question you chose. Mobile phone: You will use your mobile phone to help verify your identity when you're having difficulties logging in. This step used to be optional, but now you are required to enter a valid mobile phone number. Alternate email. You can include a second email account as your alternate address. This can also be used to verify your identity or if you ever lose your password. This step is optional. CAPTCHA test. AOL will need to verify that you are a person, so you’ll have to pass a captcha test. You will see an image with letters and numbers and you need to write the corresponding symbols in the field below. If you don’t see the image or the characters are not clear, you have the option of requesting a new captcha or the audio version, by pressing on the New and Audio buttons. Please enter the characters in the image without any spaces between them. After you completed the entire form, click on the “Sign Up” button. Congratulations. You have just created your free AOL account!